Well I was quite looking forward to getting my hands on Ubuntu 7.10 and I have to say now that I am regretting the move that took hours to download. First of all it took ages to even get me connected onto the Internet, and it still only works with Firefox and nothing else. And it still goes slow. Secondly, I’m not overly pleased with the overall look and theme of it. In some cases I preferred the older Ubuntu, although I will reitirate: in some cases. As I quite like the fonts, etc. And thirdly, the 3D effects do not work and I was quite looking forward to them. But becuase I have an ATI card (X1600 Pro), I can’t get them. Bloody open-source, might as well go back to XP, at least that does everything (almost) I want it to! I had have expected everything to go fine and not have this major networking problem. 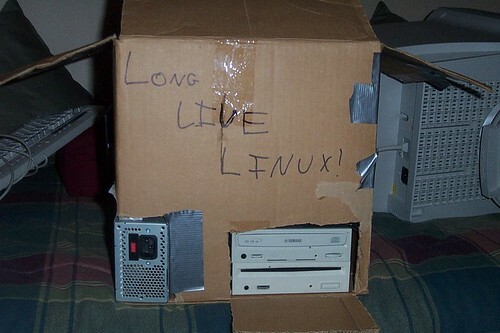 A very geeky computer user has modded together the newest, flashest computer case – a cardboard box with “Long Live Linux” written across it. The computer is running, of course, Linux Ubuntu. However, it’s not just a cardboard bux, there’s duct tape to hold it altogether! I have been using Ubuntu quite a lot lately and I have to say, I like it! Using the 64bit version of Ubuntu (a form of Linux) is quite a struggle as not all software and programs are suited towards the 64bit, but the 32bit form. So a bit of hunting over the Internet is required to either find a way to get, say Picasa, to work on Ubuntu 64bit. I am a self-confessed geek when it comes to Windows, but with Ubuntu, I pale in comparison to those who can use the terminal with ease. Despite these problems, I have found Ubuntu quite enjoyable, with a nice, pleasing interface, and not overdone. It also has great security, but maybe a little too good. Passwords are a must for any user account (though hacking can overcome this obstacle). And, seeing as my primary use of the computer is the Internet, Ubuntu can basically do everything I need it to do. And when I need to do other stuff, I just dual boot into Windows XP Home Edition. If you want a good alternative to Windows and can’t shell out enough for a Mac, or agree with Linus Torvalds when he said, “My personal opinion of Mac is not very high. Frankly, it’s a piece of crap. It contains all the design mistakes you can make, and even managed to make up a few of its own.” Linux/Ubuntu would be the best option to go for.